When one sibling is very ill it can be confusing and frustrating for another sibling. 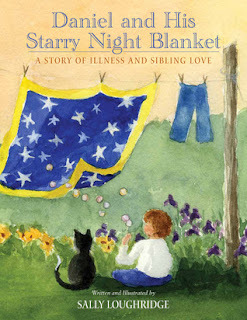 Daniel and His Starry Night Blanket is a beautiful tale of a young boy whose sister is diagnosed with cancer. At first Daniel is confused. He doesn't understand why he's not being included in everything, which makes him feel unloved. Daniel begins to wonder if he may have somehow caused his sister's illness; he even wonders if he might somehow get sick from her. Then when his sister starts getting lots of cards he becomes a little jealous. All Daniel's fears and concerns are common to siblings of cancer patients. As Daniel works through the process of gaining a better understanding of what his sister is going through, while coming to terms with his own feelings, he finds a very special way to show his sister just how much he really cares for her. Daniel and His Starry Night Blanket is an excellent book for home and school libraries and for use in clinical settings. This book is highly recommended and has earned the Literary Classics Seal of Approval.